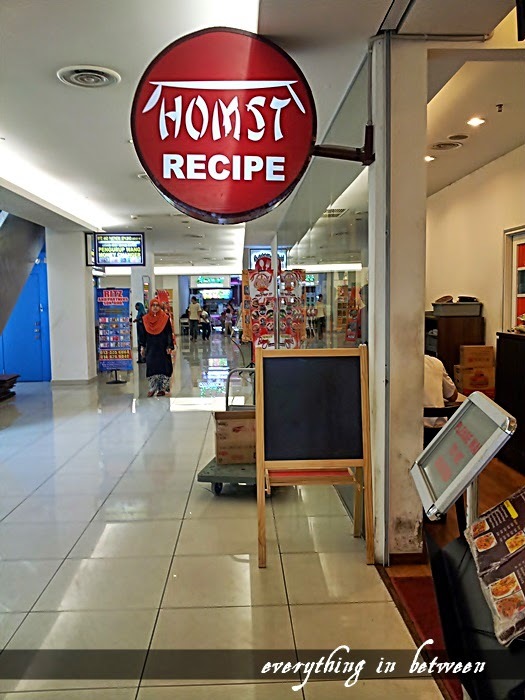 As I said before, I had to try the salted egg soft shell crab at the branch where my boss had.. and on one of the long lunch break, a couple of colleagues and I went to Bangi Gateway just to have our lunch there.. at Homst.. (ok ok.. tu tipu.. ada jalan-jalan jugak & shopping sikit)..
Its just our luck that a table became available when we entered the restaurant.. Once we had the menu in our hand.. we just can't kept ordering.. we ordered a feast for just a 3 person lunch.. ehehehe..
1st we ordered our drinks.. A colleague ordered hot laicheekang and I ordered bandung cincau special.. the laicheekang is a bit of dissapointment because it is only consist of the white fungus in longan's syrup.. the special bandung cincau is a winner.. This dish is just ok.. I prefer the ones from Serai.. Homst chicken is a bit tough and dry.. but I still enjoyed it.. This one is a winner.. I love the sauce.. not too sweet with a just a right taste of sourness.. I even licked the sauce to the very last drop.. they use the medium sized prawn and fresh.. The batter is a bit crunchy but it doesn't affect the squid.. but I do love the way they seasoned the batter.. nice taste.. The ones here are much much better than the ones offered in their TTDI branch.. The crab is still crunchy and hot.. and the sauce.. so yummy! I can't comment on this dish because I didn't tasted it.. I never liked yam.. but the colleagues do like it.. It was a fulfilling lunch I might say.. My stomach were full all through the nite..
Food : this time around I love the food.. maybe because we shared?